Mumbai, 04 Oct 2018 [Fik/News Sources]: A Mumbai Special Court hearing the Malegaon 2008 blast case on Wednesday accepted the intervention petition filed by the victims. The victims decided to intervene in the case after it was accused that the National Investigating Agency (NIA) has a soft corner towards the Hindu accused. The Special Court accepted Syed Bilal's petition to become an intervenor in the case despite a strong opposition by the lawyers representing the NIA and the acccsed. Syed Bilal's son Azhar was killed in the 2018 Malegaon blast. 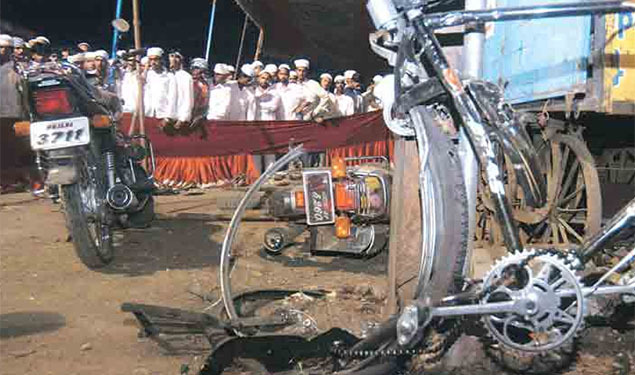 Six people were killed and more than 100 were left injured when a bomb strapped to a motorcycle went off in Malegaon on September 29, 2008 - in the month of Ramadhan and just two days before Eid al Fitr. The lawyers representing the NIA and the acccsed argued that the top investigating agency is doing its job properly and hence there is no need of any intervenor. Special judge for the National Investigation Agency (NIA) case Vinod Padalkar however overruled the objection and accepted Syed Nisar's petition. "The victims decided to become intervenor in the Malegaon blast case after they realised that the NIA is not doing its job properly. It was becuase of the NIA soft corner towards the accused after the BJP came to power in New Delhi that they were released on bail", Gulzar Azmi, Chief of Jamiat Ulema Legal Cell, said. Earlier, representing Syed Bilal, Advocate Sharif presented in front of the court various cases in the Supreme Court of India and High Courts where victims were allowed to become intervenor. "We want to help the court so that the victims get justice", Advocate Sharif said. Advocate Sharif also cited the "changed attitude" of investigating agencies taking advantage of which the accused got bail. The Jamiat Ulema Legal Cell has also challenged the bail granted to Sadhvi Pragya Singh Thakur and Lt Col Prasad Prohit - two key accused in the case. The Maharashtra ATS led by its slain chief Hemant Karkare had found that the motorcycle used in the 2008 Malegaon blast belonged to Sadhvi Pragya Singh Thakur.